In 2018, STORY's founder, Rachel Shechtman, contacted me regarding their latest pop-up experience. The concept store in Chelsea, recently acquired by Macy's, is unique in the world of retail. Every eight weeks it re-imagines itself and the products it offers for sale around a particular concept. I was pleased to be involved as they spent eight weeks exploring ideas around "the future of work" as it relates to how and where we work. When Rachel asked me to create a data visualization and I began looking for data on the topic, I turned it into an opportunity to incorporate visitors’ thoughts. 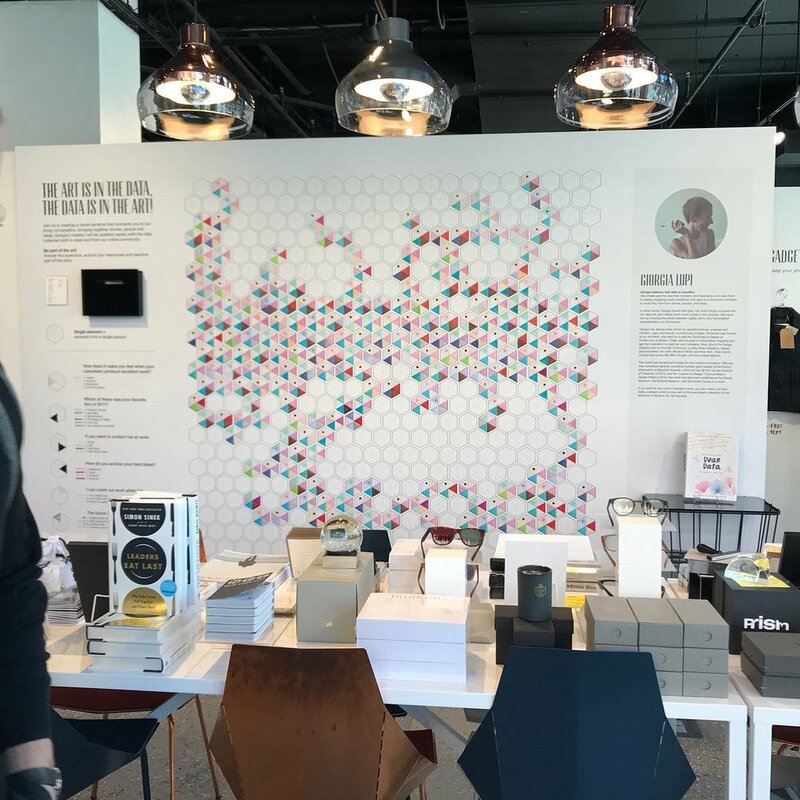 As part of my ongoing investigation on soft and small data, I created a set of questions, together with Rachel, and for eight weeks we asked visitors to the store to tell us how they see the future of work, how they unlock their creativity, and much more, shifting the focus from data to people. I created a simple system on a temporary wall in the space: an instruction-based data wallpaper that the team at STORY filled in according to my legend over the eight weeks, accommodating and revealing people's ideas and patterns around the topic of the future of work. When the wall was finally completed, it revealed that practically everyone still archives their best ideas in notebooks, and that the future of work lies not in A.I. or technology, but in collaboration. This was a simple experiment where I found working with soft, small, and crafted data more meaningful than anything else I could have gathered objectively on the topic. I used data as a lens to discover and communicate people’s ideas and personality, where people can see and find themselves; and possibly can be triggered to think and reflect more on the specific community they build more easily than through a straightforward data visualization on the topic.